However, rising awareness and implementation of techniques for vision correction such as LASIK (Laser-Assisted in Situ Keratomileusis) in addition to PRK (Photorefractive Keratectomy) are major restraints that could hamper growth of the global eyewear market. Specialty stores segment dominated the global eyewear market and is expected to continue its dominance over the forecast period. This is owing to specialty stores being the most preferred channel for end users to purchase spectacles, as they receive a wide range of services at these stores that include eye examination tests apart from services such as consultation from professional optometrists. However, online channel segment is expected to be the fastest growing segment over the forecast period. Eyewear manufacturers are focusing on offering their products through online distribution channels such as Lenskart and KREWE, in order to enhance their online presence and expand customer base. These distribution channels enable manufacturers to offer a large product portfolio along with the option of instant testing and receiving immediate feedback of the customers. Europe was the most dominant market in terms of revenue share in 2016 and is expected to continue its dominance over the forecast period. European market was valued at over US$ 32.15 billion in 2016, due to high demand for eyewear, especially for premium sunglasses coupled with the presence of major eyewear manufacturers such as Luxottica and Safilo in Europe. End-users are increasing adopting scratch proof, Anti-Reflective, and UV protection eyewear resulting in an increasing demand for eyewear in this region. Moreover, major eyewear manufacturers such as Luxottica and Safilo are based in Europe, which is another factor for the dominance of the region. Asia Pacific is projected to be the fastest growing region in the eyewear market, witnessing a CAGR of 8.63% over the forecast period. The reason for the same is due to the rising penetration of international eyewear brands such as Rayban, Dior and D&G amongst others in the Asia Pacific region. Apart from this the large population suffering from visual defects coupled with a low usage of any visual correction aids provides the manufacturers with a huge untapped market. For instance according to the Asia Pacific Optometrists Organization, India in 2014 approximately 153 million people in India required spectacles but do not have access to them. 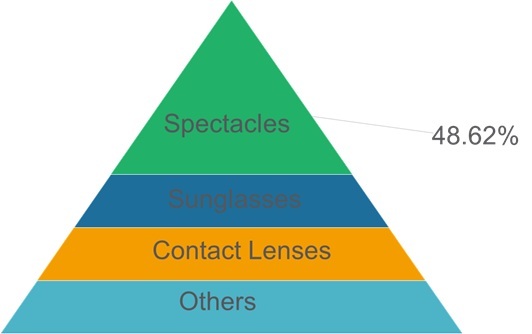 Among product types, spectacles is the dominant segment and accounted for 48.62% of the market share in 2016 and is expected to increase to 49.32% by 2025. Rising geriatric population and increasing prevalence of visual disorders are major factors expected to drive demand for spectacles. For instance, according to the WHO, about half of all 65-year-old Americans had some degree of cataract formation in their eyes with the percentage higher among 70 year olds in 2016. The WHO estimates around 2 billion people across the world are expected to cross 60 years of age by 2050, which is triple than in 2000. This is expected to lead to rising demand for spectacles. This could be a major driver for growth of the spectacles segment. Companies are adopting various organic and inorganic growth strategies in order to increase their share. For instance, in January 2017, Essilor International SA and Luxottica Group S.p.A entered into merger agreement, in order to improve its position in the global eyewear market. Some of the major market players operating in the eyewear market include Luxottica Group S.p.A, Valeant Pharmaceuticals International Inc., Fielmann A.G., CooperVision Inc., Safilo Group S.p.A., Carl Zeiss A.G. and Essilor International among others. Eyewear accessories help in improving visual acuity caused due to myopia and hyperopia. Eyewear is also used as a fashion accessory and for the protection of eyes from debris, dust and harmful radiations such as UV rays or excessive sunlight. Excessive exposure of eye to U.V. radiation or sunlight causes several disease and conditions such as macular degeneration, cataracts, pterygium, photokeratitis and may result in temporary to permanent vision lost. Increasing geriatric population globally coupled with rising prevalence of visual disorders are major driving factors, expected to drive growth of the global eyewear market. For instance, according to the World Health Organization, the number of people falling in the age group of 65 and above is estimated to be 1.5 billion in 2050. Further, changing fashion trends globally is expected to spur demand for sunglasses, globally. However, laser corrective techniques that are available to treat eye disorders could hamper growth of the market. Europe held the dominant position in the global eyewear market in 2016, due to the increasing prevalence of defects related to the eye in the region. According to the WHO about 24.3% of the overall European population suffers from myopia, and the condition is nearly twice as common in younger people and around 47% of those of aged between 25 and 29 years have myopia. Apart from this, presence of leading industry players such as Luxottica Group S.p.A in Europe is another factor for significant growth of the regional market. Asia Pacific is projected to be the fastest growing region in the global eyewear market over the forecast period, owing to rising demand for spectacles and sunglasses amongst the emerging economies such as China and India. According to the WHO, the geriatric population in the Asia Pacific region is projected to reach to nearly 923 million by 2050. This is expected to lead to rise in demand for spectacles, due to increasing visual disorders that tend to develop amongst the geriatric population. Moreover, key players are focusing on increasing awareness regarding numerous visual defects in various rural areas through programs and this is expected to aid manufacturers in enhancing their market share. For instance, in 2015, Essilor Vision Foundation team in India began an extensive program with the goal of giving 90,000 school children access to vision screenings and distribute free glasses. It elucidates potential revenue opportunities across different segments and explains attractive investment proposition matrix for this market. It provides valuable insights about market drivers, restraints, opportunities, new product launches or approval, eyewear products, regional outlook, and competitive strategy adopted by the leading players. *Browse 90 market data tables and 40 figures on "Eyewear Market - Global forecast to 2024”.